I really need to get a better camera. I've been spinning the corriedale that I dyed using gathered leaves and cammomile a while ago. I can't get any closer and the picture really doesn't show off that lovely colour very well. The colour is wonderful, a pale lemon. It's proving a bit awkward to spin because I think I've felted it a little bit. With a bit of teasing and 'snapping' to separate the fibres it's working, but I'm having to be a bit heavy-handed with it to persuade those fibres to draft properly. I'm lovin' the wheel! It's a second-hand Traditional that I've bought to re-sell. 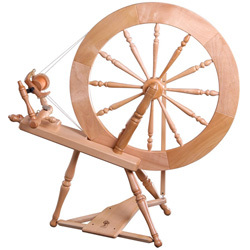 It's a real joy to use - it's spinning so beautifully compared to my old 'trundler', I might keep it!